Sherpa Scott, Simon Harford, Richard Taylor(District G.M. UGLE), William Holland,Peter Smith,and Erin Connelly-White. Saria Templeton Timaru Girls High School. Anderson and the Midland Masonic Choir. Proceeds of the evening went to the South Canterbury Mammography Unit. Kate Low, Saria Templeton, Caleb Cameron, Peter Smith, Olivia Hubbard, Julia Bennet and Alicia Kelly. years as Secretary of Lodge St Augustine. W Bro Bruce Arthur RH and family. District Grand Masters Comments for October. V W Bro Eoin Dryden, Bro Kevin Franks and R W Bro Paul Johnston. Paul Johnston is a very active member of the Midland District and was born raised and educated in Whangarei. for oil in the North of Western Australia. On return to New Zealand he joined McKenzies retail chain as a management trainee. in 1972 when the scheme was abandoned by the then Labour Government. working in Whangarei,Manurewa,Putaruru,Te Awamutu,Taumarunui, and eventually arrived in Timaru in 1985.
as an office administrator, until retirement at the end of 2015. He is married to Carol and has two children, five grandchildren and one great grandchild. His interests include reading, gardening, photography, music, motor racing and of course Freemasonry. His primary focus is his family. Superintendent of Canterbury. He is a Thrice Illustrious Master. On the 8th August we had the District Grand Master, V W Bro Pat Cooney and Grand Lodge Officers of the Otago Lakes District No 30 visit us and install W Bro Robin Gourdie into the chair at Lodge St Augustine No 99 Waimate. V W Bro David Darling was re-installed as Worshipful Master of the Lodge Koranga No 197 on the 28th August. 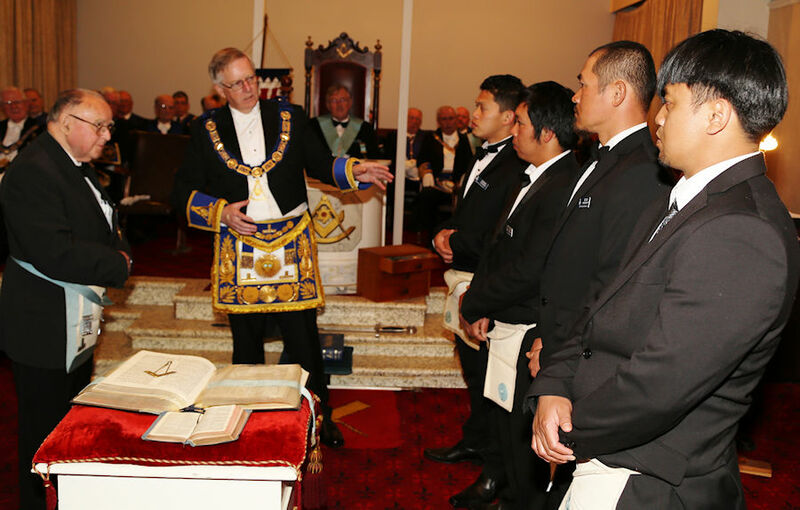 We journeyed to Kurow on the 27th September and installed W Bro D Purton into the chair. This is my mother Lodge and it was pleasing to be received back and with the help of the Grand Lodge Officers perform an Installation. The following is a few comments from V W Bro Tony Crafts Past District Grand Master. As I see it, and my thoughts on it. Greetings Brethren, I wish to relay my thoughts on twomatters. (1) The transitionfrom me being “Masonically” brought up in the two adjacent districts of Pegasus#25 & Canterbury #26 and then just 18 months ago moving south into The Midland District #28. (2) To comment on the state of the nation but more particularly the lodges in Timaru. But first. My personal background is in building and related trades, and during my married life my wife, Denise, and I have moved from one house-renovation project to another, and/or building new and fitting them out. We never spent more than 6/8 years in any one location. It has been a great experience over many years. One aspect of doing all that was that we were continually meeting new neighbours and then moving on after a few years and meeting more new neighbours. Some were very friendly, some of those we still keep in contact with today;while others were content to keep to themselves. All in all we never regretted the numerous moves along the way. What’s this got to do with my District Transition move? Not a lot, but,I mentioned above about the meeting of neighbours, some were great some neutral. That was not the case when I moved south from Christchurch to Temuka or in other words from the two Christchurch Masonic Districts to the Midland District centred in Timaru. The Timaru Freemasons and their partners wereALL great. That’s not to say that Districts 25 & 26 were not, on the contrary, what I’m saying is that no matter where we temporarily settled, the masonic community has been a great comfort ever since I was initiated in 1979. 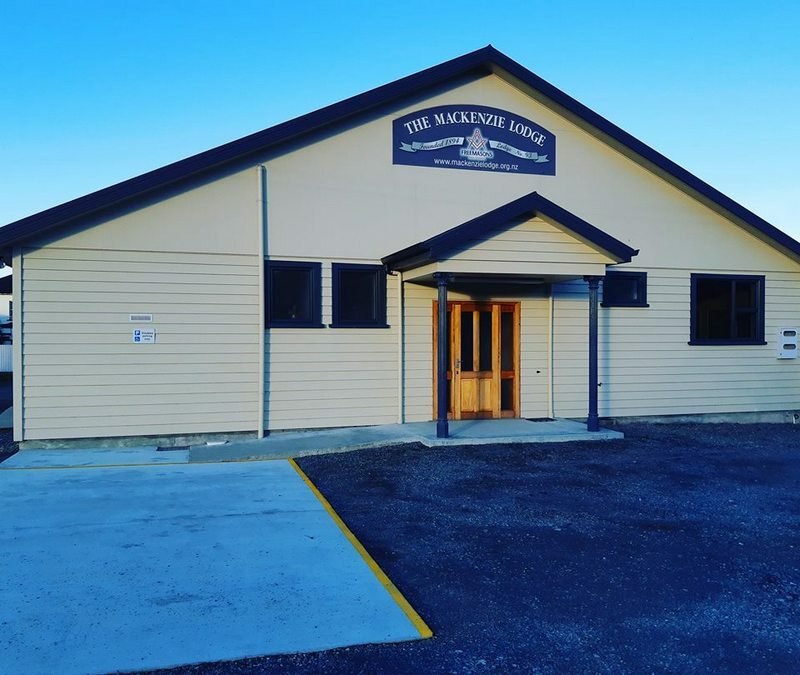 After moving to Temuka, the very first visit I made to a lodge in the Midland District was nothing short of an overwhelming experience of friendliness and welcome. The various other lodges, including those in the English Constitution, I visited were the same. I always received an out-stretch hand and a welcoming smile. What made these visits to the various lodges so inviting was that many of the members were also members of the other lodges,or that they were enjoying supporting each other by visiting one another, so I was never short of running into a friendly face from a previous visit. What also helped with that transition was that in years previous I was fortunate enough to be Secretary to the late RW Bro Brian Goodman, who was, at that time, Divisional Grand Master, and a Past Master of the Caledonian Lodge, and who also used to reside in Timaru. 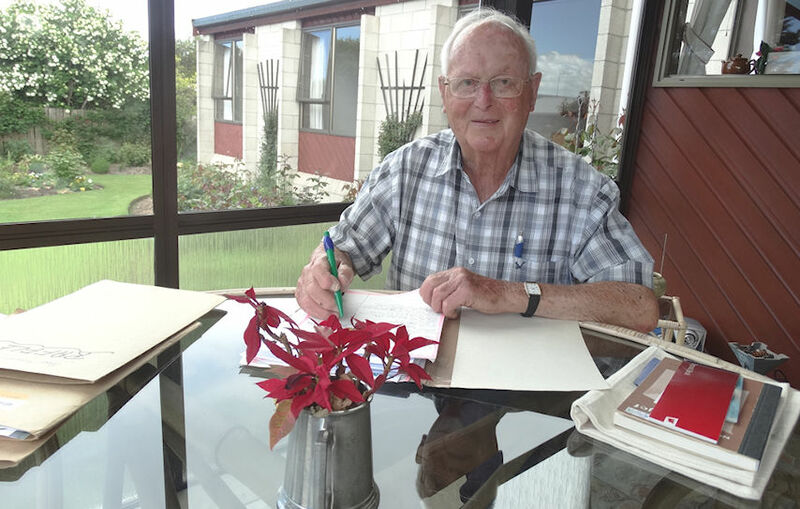 I accompanied Brian on his trips to Timaru, so many recognised who I was and it was great to meet those familiar faces again. I was soon invited to a monthly Combined Lodges’ night-out for a meal to various venues and these outings included the ladies. This was a hit with Denise and she regularly accompanies me to them. The ladies welcomed her and she was invited to attend what is called the Masonic Ladies Fellowship Group for morning teas at various places. I soon joined the Caledonian Lodge and took an active part as SW. Being a Grand Lodge Officer, the District Grand Master, VW Bro Peter Smith, invited me to take an active part in the Installations, which I did, andenjoy very much. I soon took up membership with Timaru Royal Arch Chapter and Cryptic Council, and the Midland District Lodge of Research. I have also been invited to give a few lectures here and there.So all in all, the transition from moving from the two Christchurch Districts to The Midland District has been an easy one due to the friendly nature of the brethren and their ladies. Denise and I are content with our new life in Temuka, and having our daughter and family close at hand in Pleasant Point is an added bonus, and was actually the impetus of moving to Temuka in the first place. Overall we are enjoying the start of our twilight years thanks to the friendly masonic friends in Timaru. Before I move onto my second point,I would like to say that while the Christchurch Lodges and the Timaru lodges do things a little different from each other, which has been a challenge sometimes, like learning new “Scottish ritual” at The Caledonian Lodge and getting used to different ways of the Midland District’s Installations, it’s all been great, but that’s the beauty of Freemasonry. There is no dogma. There is no set way. Each lodge and each district have their own particular and peculiar ways ofdoing things. That’s not to say that they do it right and they do it wrong, it’s just that they all do it different. Now to my second point. The state of the Lodges in Timaru. Perhaps ‘The state’is a little harsh as what I am going to bring up is really a wakeup call, not just to the Midland District but to all Districts Nationwide. I’m taking about “Membership” or the lack there of. I’m not going to repeat the many theories of why membership is receding, we’ve all heard them in the past, some in the distant past. I am not going to theorise on how we can stop the fall in membership or how we are going to gain membership, we have heard all those theories in the past as well. But what Iwill say is that Grand lodge in all their wisdom have put programs and resources in place in the past and recently,to assist the lodges with this matter. Grand Lodge cannot physically go out and get members for the Lodges. The District Grand Master can have meetings with Lodges outlining suggestions and recommendations, but the District Grand Master can’t go out and get members for the Lodges on his own. The Master of the individual lodges can call special meetings to address the problem but even the Masteris not expected to go out,on his own, to get members for his lodge. The Divisional Secretary, RW Bro Paul Johnston, recently called a meeting of the Maltby Ave lodges to address this problem, at which some suggestions came forward, but he too can’t solve the problem on his own. There is one basic fact that stands out for me and that is. There are only enough Freemasons in the lodges that meet,and attend, at the Maltby Ave Masonic Centre to justify only ONE lodge. But the continuance of ALL the lodges is necessary and vital to sustain the expenses associated with the accommodation at the Maltby Ave Centre. But, if lodge numbers continue to fall then the future of that Centre is in jeopardy which maybe sooner than you would like to think. Well,as I see it, there is only one answer, and that is, each and every one of us, as individuals, need to get out there and Speak Up for Freemasonry and physically ask a prospect if he knows about Freemasonry and then inform him of what we are about. Let him think about that, and ask him again in a month’s time to see if he is still interested. If he is…bingo. If he is not, then that’s the end of it. In either case your next step is to then go on and ask someone else. It will take 3 new members, each year, for each lodge, to hold the membership numbers at the present level. Ask yourself this. “Who, in my lodge will pass on to the GL above, within the next 5 years”?There will be more than you care to think about.Now that might be harsh but it’s a reality.Surely each and every one of us has a friend of quality who would be suitable to join our ranks. The recent notice put out by Lodge Arowhenua concerning their falling membership, is also mirrored in many other lodges in the Midland District. The Mackenzie Lodge with a membership of approximately 59 is the exception. What are they doing that is so successful? Our masonic future is in our own hands. Not with Grand Lodge. Not with the District GM. Not with the Master of the lodge.So the task for everyone is only one, and it is a simple one,ASK ONE TO BE ONE. Brethren, I want Freemasonry to outlive me. I don’t want to outlive Freemasonry. That’s how I see it. How do you see it? June and July were reasonably quiet and the District Grand Master even had time to spend three weeks in United States of America and Canada and see how others live. The Caledonian Lodge had their Installation on the 4th June and V W Bro Alex Solomon went back into the chair. This lodge has picked itself up and is starting to initiate new members and the future is starting to look bright. We had a visit from the Grand Master on the 9th June when he Rededicated the Timaru Lodge Rooms and it was pleasing to see a good turn out of Brethren and wives/partners at this function. The Worshipful Master of The Mackenzie Lodge advises that that lodge is holding their one hundred and twenty fifth celebrations in May next year and any ex members of the lodge are welcome to attend. Any members who want more information should contact the Assistant Secretary W Bro J Elston on jelston@xtra.co.nz. VWBro P W Smith; District Grand Master with the Worshipful Master of The Mackenzie Lodge; WBro Richard Fraser. The Mackenzie Lodge rooms at 44 Gall Street, Fairlie. We are starting a new programme of showcasing a senior Brother of our District and this month it is the turn of R W Bro Alex Thomson a Past Provincial Grand Master and active member of Harmony Lodge No 325.
conscripted into the King’s Own Scottish Borderers for two-and-a-half years and served in Palestine 1946-48.
awaiting them in Christchurch where Daphne taught at a high school and Alex was employed as a marine and general engineer. joined Harmony Lodge No 325.
wanted to return for the same maternity treatment as she had received two years earlier. in teaching positions but their main object was to stay with family and share the boys with their four grandparents. Christchurch Teachers’ College he arrived on Ashburton College staff so there was still a Thomson. at high school and another in the final year at primary school. grandchildren and their parents were here to help celebrate Alex’s 90th birthday. April 1951 Initiated: Lodge St Ebbe No 70, Eyemouth, Scotland. Life member. December 1951 Joined Robert Burns Lodge No 139, Christchurch. 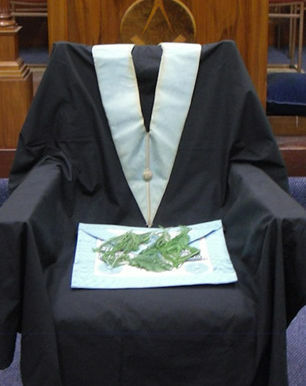 Fellowcraft and Master Mason Degrees conferred during this time. Steward. March 1954 Joined Harmony Lodge No 325, Ashburton. Steward. June 1958 Joined Corinthian Lodge No 321, Christchurch. Steward. July 1967 Re-Joined Harmony Lodge No 325, Ashburton. Steward and progressed through the Offices. 1973-74 Worshipful Master of Harmony Lodge No 325. 1978 Provincial Grand Director of Ceremonies of Canterbury. 1984-86 Assistant Provincial Grand Master of Canterbury. 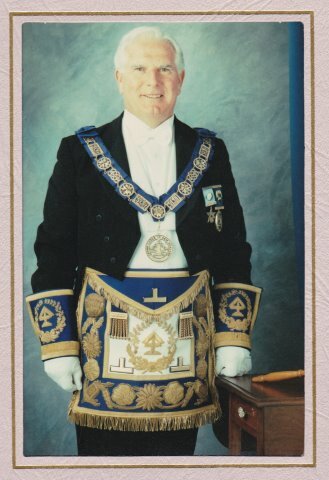 1990 Junior Grand Warden, Grand Lodge of New Zealand Freemasons. re-named The Canterbury District, Grand Lodge of New Zealand Freemasons. 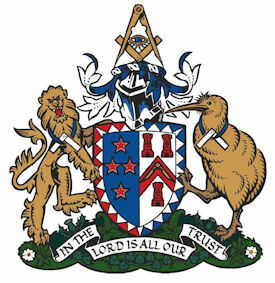 1995-96 Provincial Grand Master of the Canterbury District, Grand Lodge of New Zealand Freemasons. 2002-3 Worshipful Master of Harmony Lodge No 325 for 2nd time. 2008-9 Worshipful Master of Harmony Lodge No 325 for 3rd time. 1996-2017 Compiled Harmony Lodge notices in conjunction with the Lodge Secretary. 2000-2017 Established and Convened Harmony Lodge Membership Committee. Asst DC and 5 Stewards were all Master Masons. 2009 - 2012 Secretary of Harmony Lodge. 2012 Chairman of Harmony Lodge By-laws Committee. Re-wrote the By-laws of Harmony Lodge. 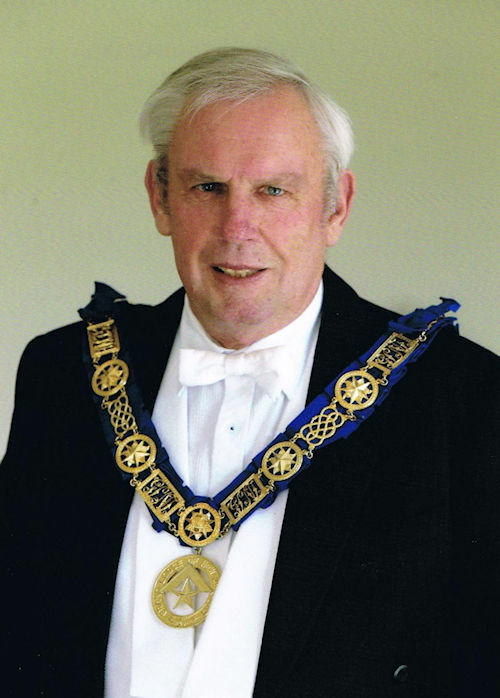 1992-93 Chairman of Canterbury Masonic Charitable Trust. 1999 Appointed Grand Representative of the Grand Lodge of North Carolina near New Zealand. 2006 - 2012 Trustee of the Ashburton Masonic Centre Charitable Trust. 2010 - Lapsed Appointed Membership Convener of the Midland District No 28. 1966 Mark Degree in Lodge St Ebbe No 70, Eyemouth, Scotland. 1966 Excellent and Royal Arch Degrees in Land of Cakes RAC No 15, Eyemouth, Scotland. 1972 Joined Rose & Thistle RAC No 35, Ashburton. 1981-82 First Principal, Rose & Thistle RAC No 35. 1990 Grand Standard Bearer in Supreme Grand Royal Arch Chapter of New Zealand. 2006 Presented with 40 years’ Service Jewel. 2018 Presented with 45 years’ Bar. 2018 - Still active in Harmony Lodge, No 325; Rose & Thistle RAC, No 35; and Installations. On the 11th April Methven Lodge No 51 had their annual Vacant Chair ceremony where a local Major Bro Ian Lattimore, Royal N Z Infantry Regiment was the guest speaker. Present were members of the RSA and the public. On the 19th April Lodge Timaru No 196 had their Installation and Bro Keith Murray was installed into the chair of King Solomon, and became W Bro Keith Murray. Lodge Koranga No 197 held their ANZAC service on the 24th April and this well organised meeting had a good attendance where W Bro R G McMeeking gave an account of his father and uncles duties during the war. Erewhon Lodge No 200 held their Installation on the 3rd May and Bro Jeffrey Sostinto took over control of that lodge,and on the 9th May Bro Leo Mario was installed as Master of the Methven Lodge No 51, the fourth Master in the Mid-Canterbury region of Fillipino descent. Our Southern Division Conference was held at Methven on the week-end of 2nd 3rd and 4th March and once again was very successful, around one hundred Brethren attending, one lodge had ten Brethren attend which was good.The future of this conference is uncertain but hopefully we will meet yearly in some form. On the 15th February Timaru Lodge No 196 initiated Mr Phillip Lamb and at the same meeting RW Bro Rob Angelo Divisional Grand Master presented WBro Bruce McDuff with his Roll of Honour. 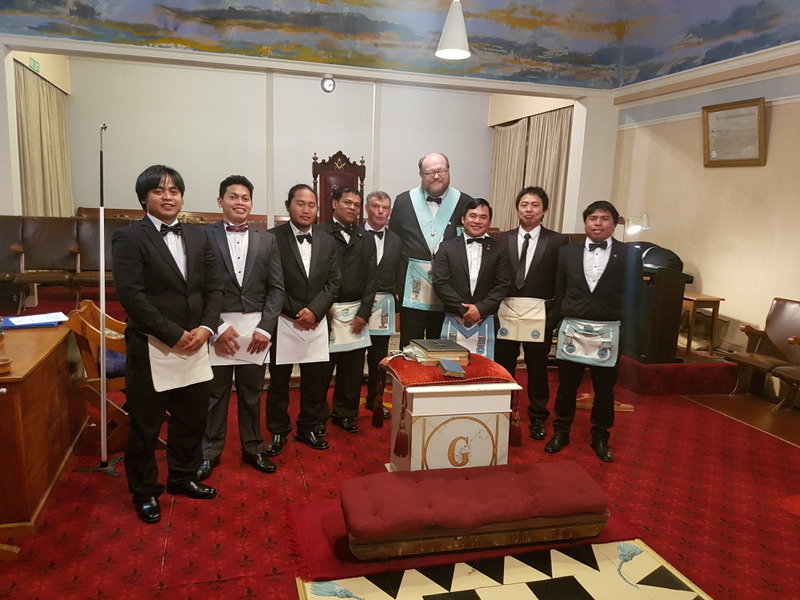 The Midland District Lodge of Research had their Installation on the 12th March and WBro Jeff Elston went into the chair.Lodge St Augustine No 99 Waimate has been busy initiating new members and the following photo shows some of them. Lodge Arowhenua No 473 has been doing the same and the following photo shows some of those Brethren. L-R Bro Nilo Pombo [SW], Bro Cryzlti Ocon [Asst DC], Bro Ivan Danar [Candidate], WBro Ariel Ocon [WM], Bro Manny Taroy [JD]. 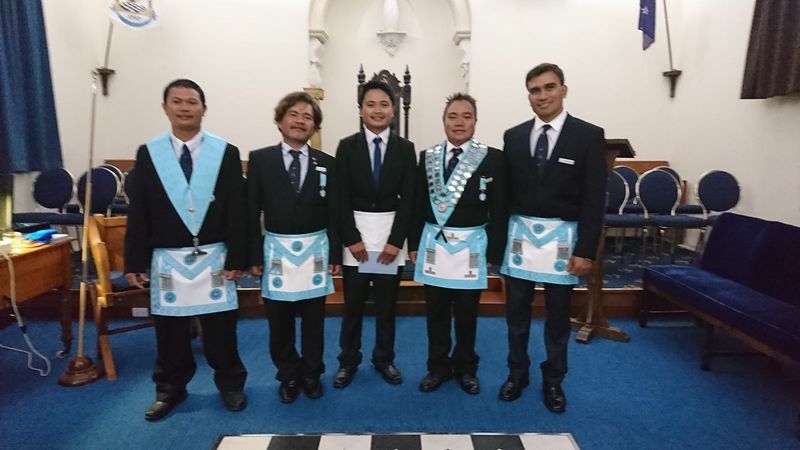 A 1st Degree ceremony for Bro Danar on Monday 23rd March 2018. I hope that you have all survived the last months heat and as I write this the days are getting cooler. No 99 and The United Forces Lodge No 245 and initiated Mr Stephen Houston. At the same meeting the Divisional Grand Master; R W Bro Rob Angelo presented Bro Jock McCrory with his sixty year Service Badge. At the same meeting, R W Bro Angelo presented V W Bro Ray Gudex and V W Bro David Darling,with Certificates of Merit for the work they have done and are doing for the District. On the 17th February 2018, R W Bro Richard Taylor will be installed as District Grand Master, South Island, New Zealand, Grand Lodge of England at the Timaru Masonic Complex, commencing at 2.00pm and I'm sure that you join me in wishing him all the best in his term of office. On the 15th February, Lodge Timaru No 196, will be initiating; Mr Phillip Lamb and at the same meeting; R W Bro Rob Angelo, Divisional Grand Master, will be presenting W Bro Bruce McDuff with his Roll of Honour badge. Would brethren please support W Bro McDuff on this special occasion. Brethren I hope you have had a relaxing festive season and are recharged and ready for what 2018 has to throw at you. It was pleasing to see a good gathering of Senior Brethren and Widows at the Ashburton Almoners Christmas Party on the 26th November. A week later Timaru held their party and although there were numerous other outings on that date there was still a good turn-out. 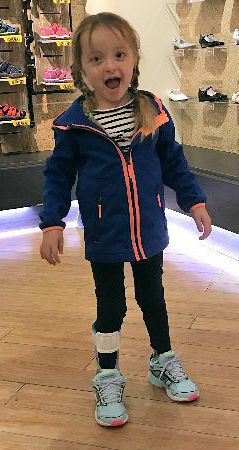 we were invited to the Oamaru Almoners Christmas Party and four of us went when Anna and Duncan McLaghlan gave a report on their daughter Charlees progress since her operation.It is going to be a long slow journey for Charlee but already there has been a marked improvement. John Ruddick is in constant contact with the family and I am sure their needs are being met. We are nearly into November and before we know it Christmas will be here. Three Installations in November. On the 7th November Bro Roel Rojas goes into the Chair at Harmony Lodge in Ashburton and on the 9th of November WBro Richard Fraser takes charge at the MacKenzie Lodge at Fairlie. On the 15th of November WBro Merv Green is installed in the Thistle Lodge in Ashburton. It would be good to see the Lodge full at these Installations. The Midland Masonic Choir is giving a concert at the Savage Club Hall on the 11th of November when the students from the Southern end of the District will receive their Musical Scholarships. An entertaining night well worth attending. 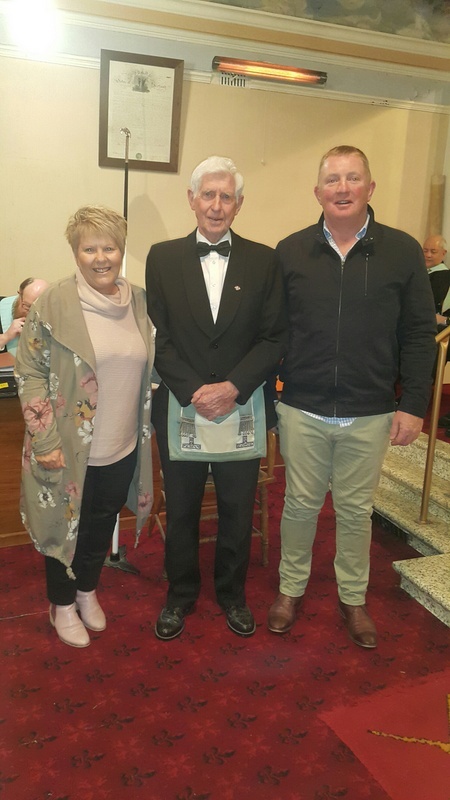 We were privileged to receive a visit from the Grand Master who attended the St Augustine Lodge meeting in Waimate and witnessed a second degree and presented WBro Ray Bennett with his sixty year bar. The Grand Master had the assistance of three Fellowcrafts and one Entered Apprentice in making the presentation. A very moving and nice ceremony. 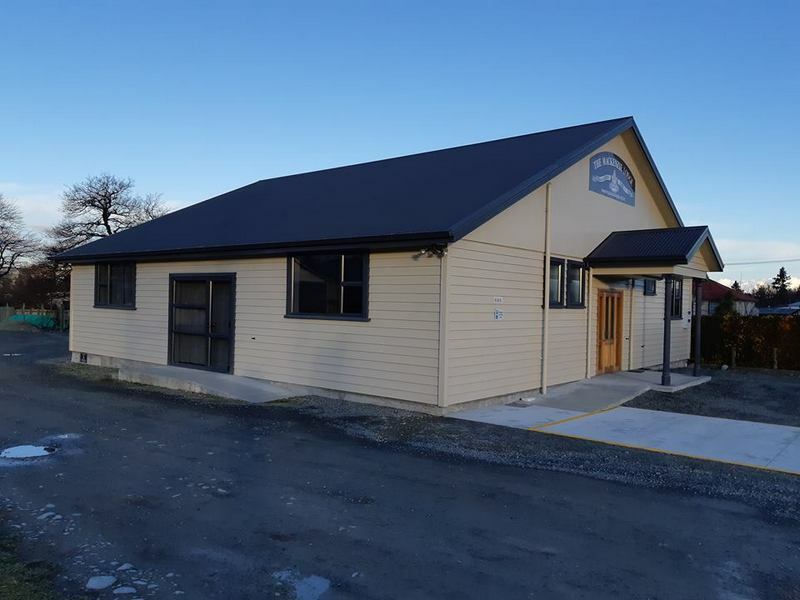 The West End Hall is being re-opened on the 3rd of November and it will be good for the Timaru brethren to have their Lodge Rooms handed back to them. A lot of work still needs to be done - but it's heading in the right direction. Don't forget to stay safe - and always "Speak Up". It is nearly October and time for daylight saving which means we get an extra hours work into the day. 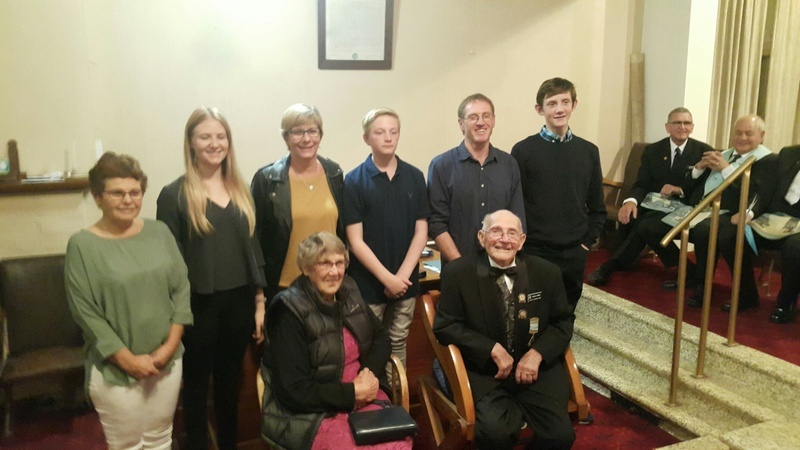 On the 24th September at the Ashburton College Auditorium the Midland Masonic Choir along with the St Josephs School Choir and the Ashburton M S A entertained us with an enjoyable concert. The organisers were able to hand to the Life Education Trust a cheque for three thousand seven hundred dollars and music scholarships were handed out to Megan Calder from Opihi College, Jack Bubb from Ashburton College, Dylan Taylor from Mt Hutt College, Logan Keggenhoff from Geraldine High School and Megan Hay from Mackenzie College. We thank the Midland Charitable Trust and the Sophia Street Car Park Trust for once again supporting this concert. A concert for the pupils from the Southern end of the District will be held in November at Timaru and I urge you to attend. We are to receive a visit from the Grandmaster at the St Augustine Lodge on the 11th October and it would be good to see a full house for this visit. The Lodge will be doing a second degree and the Grandmaster will be presenting a sixty year badge to W Bro Ray Bennett, a well known Freemason from this district. Hopefully in the next two months the West End Hall will be completed and the Timaru Lodges will be able to return home. We are around the corner and nearly into spring so in another fortnight or so we will not need to go to the Pacific Islands for a holiday as it will be warm enough here. On the 13th September the Divisional Grand Master will re-dedicate the portico at the Methven Lodge Rooms. This Portico came from the Lodge Malvern No 230 at Coalgate who received it from Clutha Lodge No 14 so it has been around a bit. It has been erected in the Methven Lodge and looks very good. On the 18th September Bro Ariel Ocon will be installed as Master of Arowhenua Lodge No 473 at Winchester so it would be good to see a full house. On the 24th September at 2pm the Midland Masonic Choir will put on a concert at the Ashburton College Auditorium when Musical Scholarships will be presented to Pupils from Mt Hutt College, Methven, Ashburton College, Geraldine High School, Opihi College Temuka and Mackenzie College Fairlie. I ask that you attend this concert and support the choir and the pupils receiving the Scholarships. A concert for the pupils of the Southern end of the district will be held in November. On the 7th August I accompanied John Poland and Lars Hansen to the West End Kindergarten when Lars Hansen presented a cheque to the Kindergarten for $1426 from the Freemasons Charity through the Caledonian Lodge so that they could replace some aged play ground equipment. In October we hope to receive the Grandmaster at the St Augustine Lodge, we are busy organising this now and will keep you posted. In the meantime keep warm and do not forget to cancel those tickets to the Pacific Islands. Berry Mitchell, Concert Organiser for the Midland Masonic Choie until his retirement last year after 25 years of service! I hope you are all managing to stay warm as we journey through Winter. 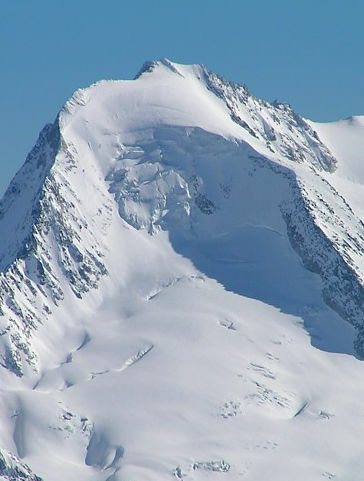 We have had two Lodges have to cancel their meetings because of snow (so much for global warming) and as I write this many parts of the Eastern South Island are under a State of Emergency due to flooding. On Sunday 9th July about twenty freemasons gathered at St Johns Ambulance Temuka where W Bro John Lynch Master of Lodge Arowhenua No 473 and V W Bro John Kinvig Past District Grand Master presented a cheque for $7420 from the Brethren of the Midland district to the Association. This Money will be used to purchase new equipment for training staff. On Saturday 24th June twenty freemasons meet in Ashburton for a Seminar run by the Southern Division. The Divisional Lecturer V W Bro Graeme Martin led a discussion on Education of new Brethren, Expectations about the work for new members and enhancing membership of your lodge. W Bro Graeme Wakelin the Charity Officer led a discussion on fraternity of the mason and W Bro Geoff Cain spoke of efficient lodge meetings/good information/talent. We then had a discussion on strengths and weaknesses of our District. Our next Installation is at Waimate on 9th August when W Bro Arthur Mahan is installed as Master of St Augustine No 99 and it would be good to see a good turn out at this Installation. In the meantime keep warm. May saw two Installations with W Bro Mark Aguila being re-installed as Master of Lodge Erewhon and W Bro Peter Rusbatch taking over the leadership of the Methven Lodge and by the time you read this V W Bro Alex Solomon will be re-installed as Master of The Caledonian Lodge. 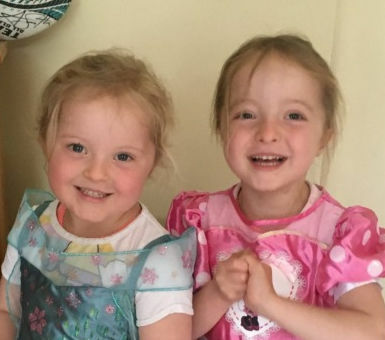 “We can not thank the Freemasons enough for what you have done for Charlee. I cried a great deal when I opened the E-mail and sent a photo of it to Duncan straight away as he was with Charlee in hospital when it arrived. We do not know how to thank the members as we were completely lost for words on how much you all managed to give”. Thank You Brethren, have a good month and keep warm. It was pleasing to see The Mackenzie Lodge have a stand once again at their local show in a prime position where the public could see them and having Brethren from throughout the Island come and make themselves known. It can only do good for the organisation. Next month May we have two Installations, the first is at Ashburton on the 4th May when W Bro Mark Aguila is re-installed at Lodge Erewhon No 200 and then the next week on the 10th May. W Bro Peter Rusbatch takes charge of the Methven Lodge No 51. It would be great to have a good turnout at these Installations. On the 12th April Methven Lodge No 51 held a Vacant Chair ceremony which was well attended and a report on this well attended meeting was on the last issue of the carousel updates. The Divisional Conference is over for another year and it is good to hear how some progressive Lodges are attracting members. One of the best conferences I have attended, good popular topics discussed in a cheerful and good masonic way. Our next installation is at the Waimate Lodge Rooms on the 20th April when Mr James Annear RH is reinstalled for Lodge Timaru No 196. Jim is a popular member of our Organisation and an inspiration to all of us. At ninety years of age and one of our elder Masters in the country he can still at a couple of days notice do any of the charges in the three degrees including the Tracing Boards. He is a person that keeps his brain very active and has no worries about those problems that some older people have like loss of memory. It would be great to see a good turnout of Brethren at this Installation. It is also good to see the Lodges supporting the appeal for Charlee McLachlan, thank you for that. Peter Smith District GM's month's Comments. We are at the stage with our websiten where everything is staring to happen and George Currie has the whip out and it is starting to hurt. December was tken up with quite a few Christmas functions for our widows and older brethren and it was good to see good numbers at these functions. January was reasonably quiet Lodge wise, but Methven, Waimate who normally meet on the same night and cannot visit each other joinwd forces with the United Forces Lodge from Christchurch, a former 2nd Wed night Lodge and worked a second degree, with the usual large turn out for a January meeting, (69 present). February brought with it a busy month with most Lodges working degrees and it is gratifying to see a good number of nominations coming through. This month of March we install Robin Gourdie into the chair at the Midland Lodge of Research #436 at Winchester Lodge rooms and it would be good to see good numbers there. Later this month we have the Southern Divisional Conference at the Methven Resort Hotel in Methven, and after a slow start numbers are starting to pick up, and looks like it will be very worthwhile. The Hall next to the Lodge rooms in Timaru is about to get the roof on after thw disasterous fire 10 months ago, and it will be good when we can get back into our Lodge rooms again, it can't come soon enough. Brethren this web page is for you and the more material we get to put on it the betterit will be. You will either make or break it, so any thoughts, opinions or anything else will be gratefully received.